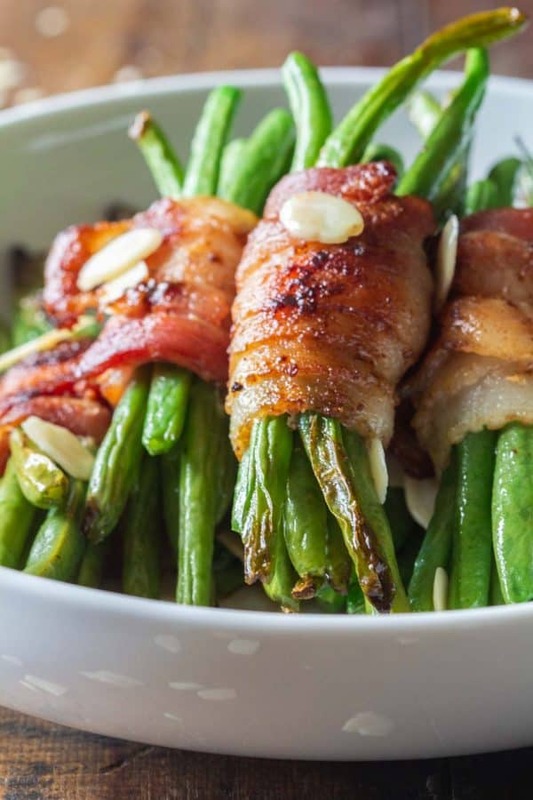 Bacon Wrapped Green Beans are the most PERFECT quick and easy stove-top side dish. Leave the oven free for the main dish and dessert by making these bundles in a pan! Stove-top side dishes are perfect for Thanksgiving, Christmas, New Year’s or any other festive dinners or family get-togethers. Your oven will be basically blocked for mains and desserts so always choose sides that can either be made in a pot or pan / slow-cooker / pressure cooker or served raw, such as this delicious Broccoli Slaw. This recipe is spectacular. There is no other way to describe it. 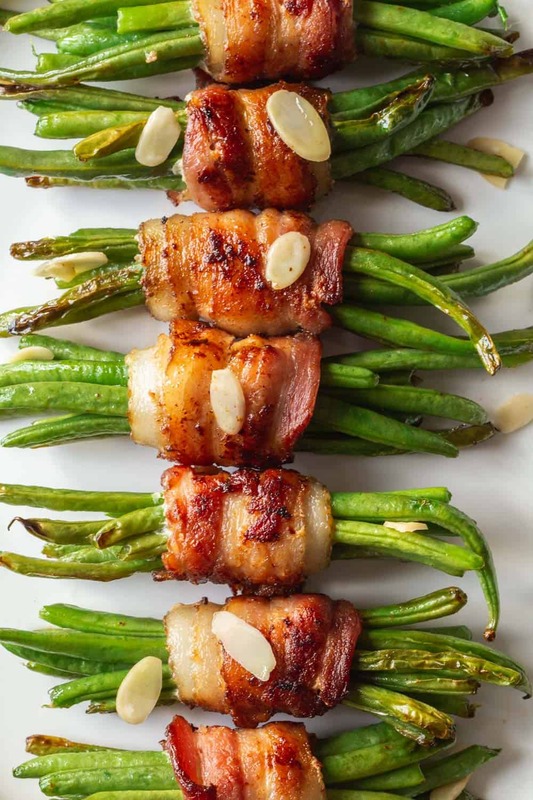 I mean, say it, just say it: Bacon Wrapped Green Beans! *angelical ahhhhh* Are you drooling yet? You don’t need any seasoning at all. The beans, bacon and sliced almonds are so incredibly flavorful and complement each other so well, you won’t miss any salt or pepper. 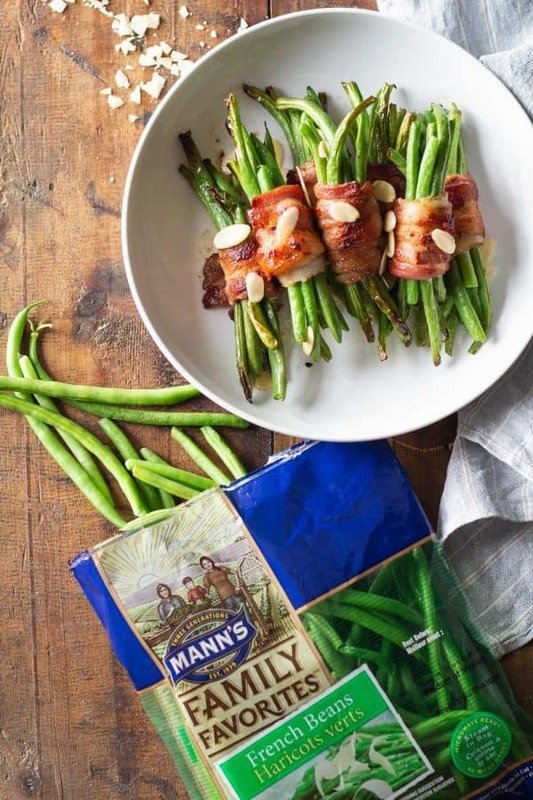 Choose a trusted brand for your green beans such as Mann’s French Beans for best flavor and quick prep time. Mann’s French beans are already washed and trimmed and ready to eat. The same applies to the bacon. Make sure to get higher-welfare pork bacon for the best flavor. Don’t go for the chain supermarket pre-packed cheap breakfast bacon. Go to your local butcher or a small farm outside your city to get the good stuff. It’s super easy to make your little bundles. You just lay out the rasher of bacon on a cutting board, pick 8-10 beans and then wrap them as tightly as possible (see video). Not too tight for the bacon to rip but tight enough so no bean can fall out. It’s important you use raw beans not blanched or cooked because if they are soft the ends will bend downwards and burn at the bottom of the pan while the bacon crisps up. The steaming or softening of the beans happens later. Once the bacon is already crisp. Put the lid on and let steam build up to cook your beans. I like mine crunchy so I leave them in the pan with a tight sitting lid for approximately 5-7 minutes. If you like yours softer you can add a splash of water (maybe 2 Tbsp) and then immediately put on the lid so more steam is built in the pot. It’s important to reduce the heat to low as soon as the lid is on so the bacon doesn’t burn. I would say you can leave them in there on low heat steaming for up to 10 minutes without risking burnt bacon. 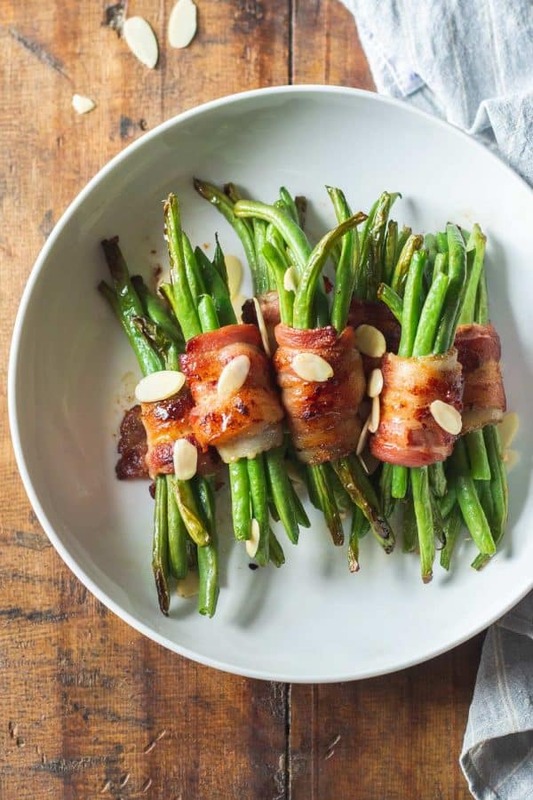 Are Bacon Wrapped Green Beans A Make-Ahead Side Dish? Yes! Believe it or not, they hold their shape really really well. I tested this by making them in the morning, storing in the fridge all day and reheating in the evening. Just preheat a pan over medium low heat, put the bacon wrapped green bean bundles in a pan with a lid on for 2-3 minutes and they are warm. The best part about this is that if you don’t have a gigantic pan but want to make loads of bundles you can make them in batches and then store in the fridge. Once it’s time to serve you can add a lot more to the pan because #1 they reduced in size and #2 they don’t need to be placed with a lot of separation of each other into the pan anymore. When frying at first you have to make sure the bacon part of the bundles don’t touch each other. Once crisp, for warm up, they can touch. 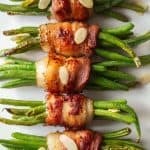 Top your bacon wrapped green beans with some sliced almonds for super deliciousness. It gives the beans that special little extra it needs to remain unforgettable to all your guests. If you’re still unsure what to make as a main, check out this amazing Pot Roast. Preheat a heavy bottomed skillet (that has a tight sitting lid) over medium-low heat until really, really hot. In the meantime, cut off any end still on a random French bean. Wrap 1 bacon strip very tightly around about 8-10 green beans. Add wrapped beans to HOT skillet and brown from every side (about 2-3 minutes per side). Add a lid and cook for 5-10 minutes, (add a splash of water if you like your beans soft instead of crispy before adding the lid), take off lid and serve. 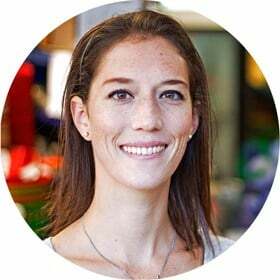 Hi Claire, it depends how long you let it crips up. I’m always more concerned about my beans staying crispy because I really don’t like soft beans. The very center is definitely rather on the soft side and only the first two layers of outer bacon really crispy. I need to make about 5 hours before serving and I won’t have a stove available. Do you think I could make the recipe as is.. then pt in crockpot to stay warm or would it get soft? Hi Ryann. I’m afraid they would turn soft in the crockpot. But you can cook them all as instructed and store in the fridge and then when it’s time to serve preheat a big lidded pan and then add them all in one layer once it’s hot and put the lid on. Heat them up for a couple minutes and serve. Hi Tara, yes, they are. Are these considered “Keto” friendly as well?? Do you think you could throw these in a crockpot and they would turn out the same? Or any suggestions for making these in a crockpot? Hi Dev, no I don’t think it would turn out in a crockpot. The bacon crisps up in the pan thanks to the high heat of the pan. If you make them in the crockpot the bacon will stay soft and not crunch up at all. What could work is make them in the oven. I haven’t tried but at high heat and turning them mid through you could make them on a baking sheet. These are called ‘fagot’ in France, and they are traditionally cooked in the oven. 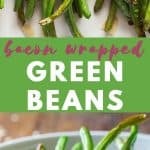 To bake, you want to make sure that you get the finer green beans (the smaller, thinner ones) because the larger green beans typically found in American groceries will take too long to cook and will result in undercooked green beans wrapped in burnt bacon. For baking in the oven, line a cookie sheet with parchment or a silpat mat. Preheat oven to 350F, and bake for 15-20 minutes. Very interesting Angelique! Thank you for sharing. If I ever find the thinner ones around I will for sure try your recipe ? I’m wondering if you could blanch the bigger green beans first so they come out cooked from the oven. I love the first snow. We are in Washington, DC so that may be far away! These little bundles of goodness look yummy! Yes, I have to (secretly) admit, that I love the first snow, too. Actually I love it up to New Year’s Eve and from then until it’s gone I just wish it away, haha.